Rachel and Claire here, fresh off a day full of adventures and sun. We woke up to another big breakfast of pancakes, eggs, oatmeal, and fruit. 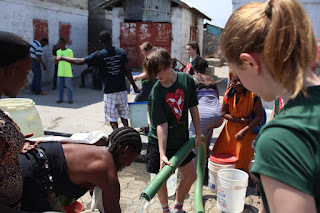 We first ventured to City Soleil (the largest slum in the Western hemisphere) to distribute water. There are three tasks to perform: fill buckets, carry buckets back to houses, and to love up on the kids. At our first stop, we were swarmed by young kids motioning for us to pick them up into our arms and we were hardly off the tap-tap. There were so many of them and our only regret was that we couldn't pick them all up at once. 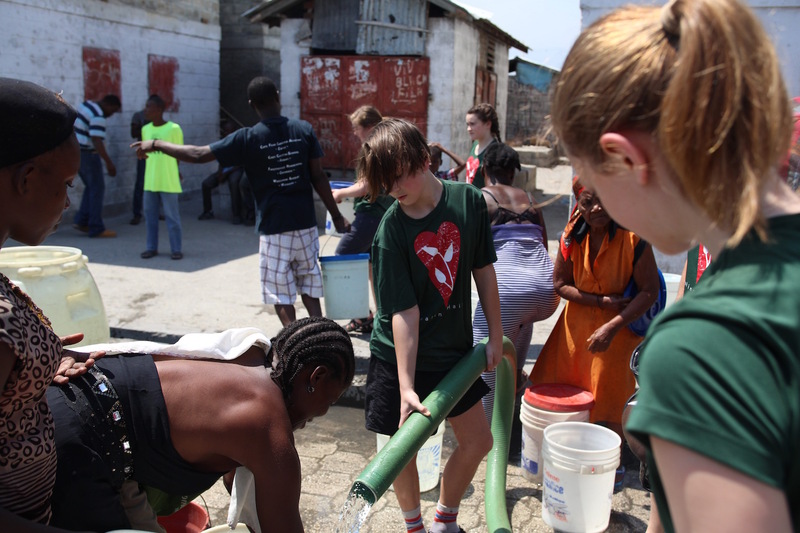 While some played with the kids, others worked on filling the buckets with the hose and carried the buckets to the people's houses. We were overwhelmed by the amount of buckets that needed to be filled and were astonished by how different their worries were than ours. While we focus on our non-important worries, they have to worry about so many aspects of our life we take for granted. Meeting the people was very eye-opening and it was incredible how little the language barrier affected how we interacted with them. 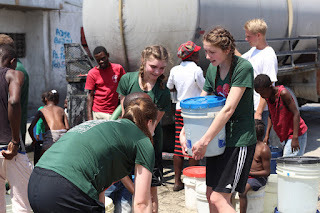 After our first water truck stop, we walked up a hill to a church in the city which also serves as a school. The school works to educate 160-200 kids. This year they only have a kindergarten class, but will add a class each year as the kindergarten class moves up. There are more kids to educate than they have space for, but it is a start. They also have adult literacy programs. Sam, our guide, told us that there was a 62 year old woman who just finished the program. She said for the first time she did not feel like a child because she could do more than read and write her name. The program changed her life. The church itself is a miracle. It was built on a landfill under 40 feet of trash and spread over 26 acres. When they were constructing it, they were putting the footings in and thought they would have to go 20 feet deep. What they realized was, that they had to go twice as far down because of the amount of trash under the foundation. Another awesome aspect of the church is that they used all Haitian labor to design, construct, and build the church. When the issue is poverty and the reason for poverty is lack of jobs, it is essential that organizations like Healing Haiti pay Haitians to do work like this. After sitting in the school we went into the back where we got an overhead view of the city and all its poverty. There were houses made of tin cans as far as the eye could see one way, and the dirtiest inlet you have ever seen another way. There were pigs and trash everywhere, and we couldn't help but compare it to our excess lives. Then we got on the tap tap and ventured to our next water stop. This stop felt slightly less impoverished and the houses were made out of concrete and not metal scraps. Mark particularly loved this stop and could be found challenging the citizens to arm-wrestles. After several laughs and hauling of many heavy water buckets, we headed to our next stop. Next, we headed to a mango and coconut farm where we were able to try the coconuts and take home mangos. It was very hot, but it was very interesting and the coconuts were de-lish. Our last stop was at Haitian Initiative, a program which promotes education and soccer playing. 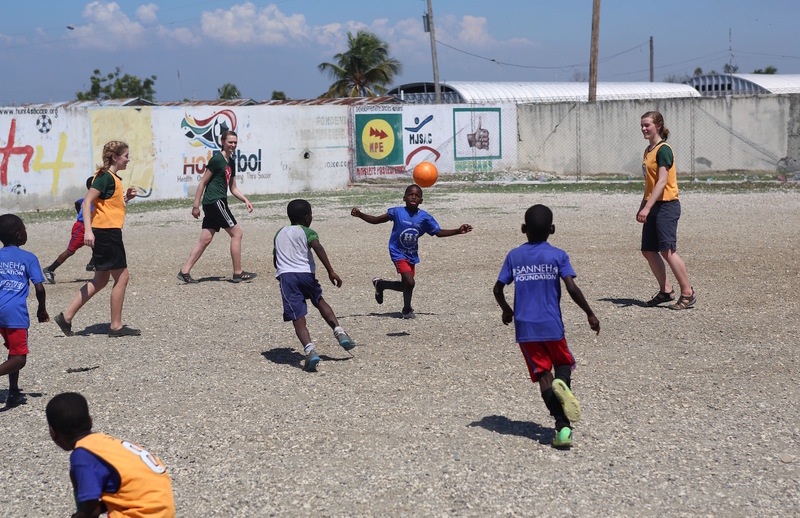 The students must maintain their grades in order to continue playing soccer. All of us ended up joining their practices and getting schooled by the youngsters. Mr. Witchger was a fan of the soccer and displayed his skills for us all to see. After a while of playing, we prayed with the kids and fed them lunch. After a long day of sun, we returned to the tap tap and went back to the compound. At night, we were visited by Miquette, an inspiring speaker who told us about her transition from poverty to a successful, registered nurse. Her parents had to make a tough decision to put her younger sister up for adoption in hopes for a better, more healthy life. Years later, when Miquette was about high school age, the family that adopted her sister brought her to the U.S. (Detriot Lakes, actually), to get a good education and to go to college. With help from the rotaries she was able to finish high school and go to college at Concordia in Moorehead when she finished by achieving her dream of becoming a nurse. She came back to Haiti and because of the blessings she has been given, believes it is her job to bless others. 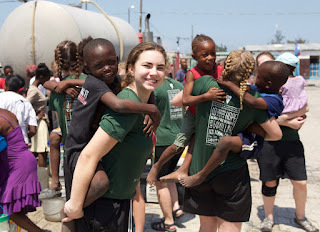 She is currently funding a school for poor children with plumbing and electricity and the ability to fund all their educational needs/supplies. Many of us bought bracelets and necklaces from her which her students helped to create. After listening to her amazing story, we received Salsa lessons which everyone got very, very, very into. Maybe too much. Overall it was a fun and eventful day, and despite our heavy sunburns, we are REALLY looking forward to the days to come. 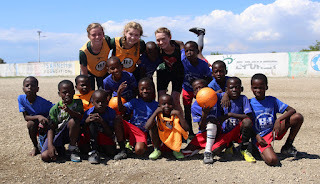 Haiti has been a great change for me, they actually give me food. However, I miss you guys a lot and am looking forward to telling you guys about all I've experienced. If you guys will listen... JK, Love and miss you guys.